Lowrance Endura Sierra | Our complete unbiased handheld marine GPS review and more on marine electronics. The Lowrance Endura Sierra is the top of the line unit of the three in the Endura™ series. The entry-level Out&Back and the versatile Safari fill out the lineup. All three were released in 2009. The Sierra will be the first unit in the series to be subjected to the rigors of our handheld marine GPS review procedures. Our test unit was packaged with a mini USB data cable, quick start guide, and owners manual. It is fairly compact in design and measures 5-inches tall, 2.3-inches wide, and about 1.3-inches thick. With a pair of AA batteries installed it weighs in at 8.1 ounces. 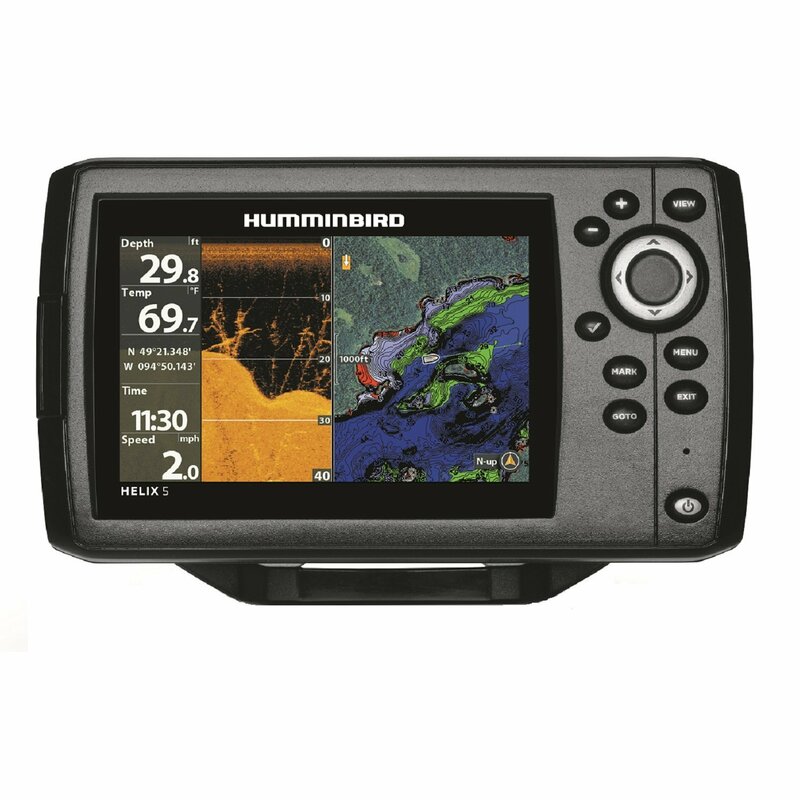 The Sierra features a premium level base map and is fitted with an onboard compass, altimeter, and MicroSD card slot. Five pushbuttons, a four-way arrow key set, and touchscreen capabilities make using and controlling the Sierra a breeze. The unit also has a side-mounted on/off pushbutton. All the front panel pushbuttons are clearly marked with on-key labels. I found the unit fit comfortably in one hand while being easy to operate with my free hand. Main pages on the Lowrance Endura are selected by successive presses of the Page button. Important pages for the boater include the Map, Satellite, Trip Computer, Nav Status, and Compass. The Map page displays a basic land and road map but had no coastal details in the areas we checked. You can set the display mode to imagery or hybrid and get satellite marine data to display when the map is scaled to show a large area. Touching the map screen anywhere gets you the Option button and range buttons. This unit does have a microSD card slot for optional marine chart data. The Satellite page gives you present position as well as satellite signal strength and azimuth. The Trip computer page displays four data boxes whose source can be user selected from a long data list. Navigation Status is a useful page when tracking to a waypoint. It gives you a compass rose and bearing pointer to follow. Data boxes at the bottom of the page supply numeric data about the waypoint and navigation to it. You’ll find a large compass rose centered on the Compass page. It features an index mark every two degrees and both numerical and letter labels on prominent headings. A user selectable data block sits in each corner of the screen. An electronic compass sensor provides input for the on page compass. You should calibrate the compass before use. The Menu key brings the main menu up onscreen. From here you can select the map page, use a find function for waypoints or other points of interest, and choose settings for a variety of pages and functions. The Waypoint Edit page comes up after a waypoint is created with the Mark button. From here you can change variety of waypoint information. Start up of the Sierra can take a little time. First off, the unit needs to load software, while doing so a mountain background screen shot displays onscreen and all pushbuttons are not functional. This process takes about 40 seconds. Next, the unit needs to lock its GPS position. For us, this took an additional 30 or so seconds. Pressing and holding the Mark button for a few seconds creates a waypoint at your present position and opens the Waypoint Edit screen where you can change the name, symbol, or add a comment. Data entry is a cinch with the Lowrance Endura Sierra as a full touch keyboard is displayed onscreen when needed. This is one of the biggest advantages of a touchscreen device. You can also record a voice note about a waypoint if desired. I recorded a voice one to see how it worked and found it difficult to hear the playback even with volume set at maximum. Im not sure this feature will have much use for boaters. Routes are very easy to build with points already loaded into the machine. Simply select the Route page from the Find menu, and then follow onscreen prompts to add points to the route. The Lowrance Endura Sierra can store up to 2000 waypoints and 60 routes. The Lowrance Endura Sierra uses a large 2.7-inch color touchscreen with a very respectable 320 x 240 pixel resolution. This is the first touchscreen marine handheld GPS review weve conducted. I found the Sierra display screen very easy to read in shade conditions. However, in bright sunlight the screen can be difficult to read. Adding your polarized sunglasses makes things worse by adding a purple shade to the screen and darkening it further. I am going to rate the Endura Sierra screen only Fair for daylight viewability. A full touchscreen keyboard for letters and numbers makes data entry a cinch with the Lowrance Endura Sierra. In low light and at night screen viewability is excellent. The downside at night is a lack of any pushbutton backlighting. Access to the battery compartment, located on the case back, is via a quarter-turn stainless steel twist lock. The 32GB microSD card slot and the mini USB port are located side-by-side on the bottom of the unit and protected from water and weather by a form-fitted rubber flap. The Endura Sierra has a few features not often seen in a marine handheld GPS unit. It can serve as an MP3 player, picture viewer, and video player. Data for these functions would be uploaded from a computer using the supplied mini-USB or read directly from a microSD memory card. Sierra has a built-in electronic compass and barometric altimeter. It also has a jack to connect a headset. It carries a one-year warranty and is rated water resistant to IPX7 standards. That means it can be submerged to a depth of 1 meter for 30 minutes and not be damaged. The Sierra passed both our dunk and drop tests with no issues noted. The Lowrance Endura Sierra is a unique handheld GPS offering some top notch features and functions. One of our favorites is the touchscreen data entry keyboard. You simply can’t compare this to units that require slogging through letter and number lists to enter waypoint names and comments. The jury is still out on whether this is a good pick for boaters. We’ll let you know after I see a unit with a marine chart card installed. Buy this Lowrance handheld GPS here.